Kids Can! – One Can at a Time! An In-School Empathy and Service Project for Kids Eager to Make a Difference! Help them make a meaningful difference in their own community by “adopting” their local food pantry. Children who are typically on the receiving end of donations… those whose families struggle to put food on the table themselves… may not have many opportunities to give to others. One Can At A Time is a canned food drive created specifically for schools serving low income children and other programs that serve children living in poverty. Instead of asking each child to bring in a bunch of cans, which may be a hardship, we ask each child to bring in a single can of food. Even for families that are struggling to get by, donating one can is usually manageable, and for the child, is a meaningful symbol of giving back, an experience not always typical for families living on the edge. Schools, After-school programs, community and religious programs for kids or anywhere children gather on a regular basis. Family-to-Family will locate and connect you with a nearby food pantry in need of donations. Every other month during the school year two grades in your school (or groups of kids) will collect, count, sort, and box up non-perishable foods and personal care items. Kindergarten & 1st grade might collect in October, 2nd & 3rd grades in December, 4th & 5th grades in February, etc. That’s a total of 4 or 5 times a year, with each grade participating twice during the school year. Each child is asked to bring in just one can or item during his/her grade’s turn. 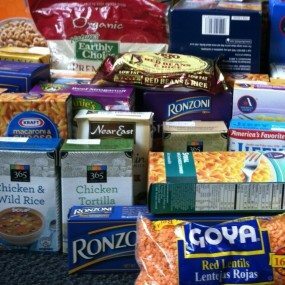 Unlike other food drives, Kids Can! – One Can at a Time! is ongoing, and its collaborative protocol encourages teamwork and responsibility. Students not only bring in food during “their” month, but they also work together to make collection boxes for their classrooms, design posters, count up the collected items and pack everything up for the pantry. We’ll get you started. Along with a written packet explaining how the project works, we’ll set up a phone call between you and Pam Koner, the Executive Director of Family-to-Family, to explain the program in more detail and to answer any questions you might have. If there are students in your school who can’t bring in a can to donate, we’ll make sure they can be givers too. We’ll provide you with the funds to purchase canned food to store in a small “emergency” closet, so that children in need can discreetly pick up a few cans when it’s their class’s turn to give. Of course, another plus is that some of your school’s families might be using the pantry they’re helping to keep stocked… so the can they give might be one they also receive! But the value here – of encouraging empathy and of providing children with the tangible understanding that they can improve their world — is so much greater than the actual can! Our hope is that Kids Can!’s hands-on protocol will inspire empathy and generosity, as well as give children a tangible understanding that they have the power to improve their world. For more information or to get started, please email us at moreinfo@family-to-family.org.